We purchased our ATS-4 after renting one on vacation. We really liked it and bought this car within 30 days of returning home. It's a Premium model with the 2.0L Turbo. Best fuel mileage to date was a 200 mile trip to Madison, WI for Christmas. Mileage was 31.2 while driving 70 - 73 MPH on the Interstate and 60 - 65 MPH on Hwy 18. Regular day in/day out mileage has been 26 - 27 MPH in combined driving. Very happy with the fuel mileage and the decision to buy this car. One of the reasons we bought this car is it doesn't look like 99% of the other cars on the road. Our's has the "Morello" or burgundy leather interior which really looks sharp with the black exterior. We really like the carbon fiber trim accents on the dash and doors. The 2.0L Turbo provides plenty of HP and torque to make merging on to the highway a breeze. Built on the same chassis as the new Chevy Camaro, the car out handles most cars - making a true pleasure for a sporting enthusiast to drive. The OE tires are average in the snow or ice. Totally fine on dry pavement. Braking is outstanding with the Brembo brakes. 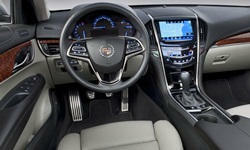 Ride is firmer then the stereotype Cadillac smooth - and that's a good thing. If I were in the market to buy a 4 door sedan again, this would be one of the very few cars on the list. a love our ATS4 2.0T too!. Perfect size for DINKs and two dogs or occasonioaly carrying two in the rear seat. Ours is a 2013 and we'll out of warranty and finally the CUE screen delaminated. But replacements are less than $300,00 online. Other than that runs well with a ecu tune and sees 37 mpg at 65 mph. It is plenty comfortable with sports cat like handling and brakes to die for they are so good. 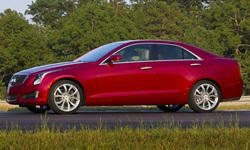 See TrueDelta's information for all Cadillac models.